Well I’ve already got one Christmas party under my belt, and I have a couple more coming up… luckily I’m able to take these things in my stride and aside from downing a few mulled wines I do love to amp up the glamour and the glitter for a little something extra special. Whenever you have more time, MAC Vanilla pigment comes out to play – it’s a bit more time consuming and definitely messier, but it gives the prettiest finish to the skin and really managed to catch the light. I’ll just be dusting this under my brow bone, and basically all over my entire face. When I want a smoky eye, the Charlotte Tilbury palette in Rock Chick is the one I always reach for. I love the grey tones as an alternative to the warm bronzes I always wear, and this one does make you feel a little bit Kate Moss when you wear it, especially with lashings of mascara and everything smudged out. My new liner love is the Kat Von D tattoo liner – how did I live without this? It gives me a cat eye without even trying and literally stays on all day. For a lip that goes with anything, MAC craving is the way forward. It manages to brighten the complexion and complement every look. It’s an amplified finish, so it goes on creamily and then dries down a little bit. I love this shade! I don’t know about you, but that cheek flush that comes after a glass of wine is not my favourite look. I much prefer the peachy and brightening tones of the By Terry blush in Platonic blonde. I don’t want to look like Rudolph, y’know. 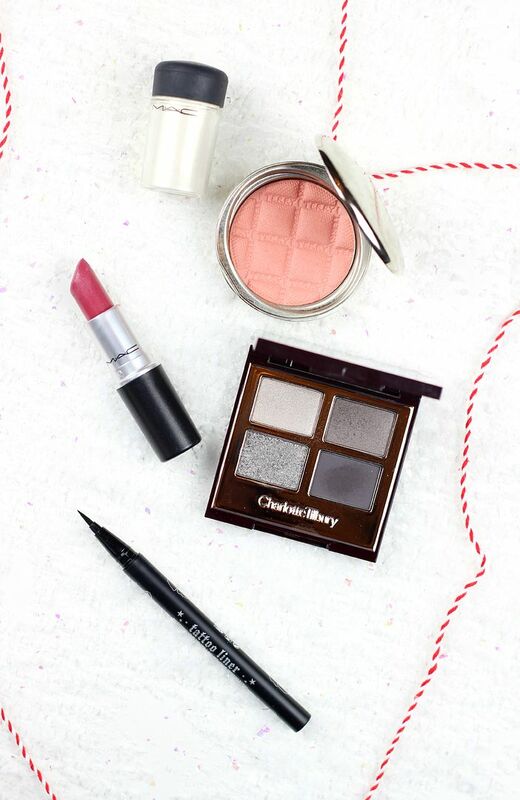 What makeup are you wearing for your Christmas parties?